Every fleet in EVE Online is only as good as the players leading it. But unlike real-life generals, the Fleet Commanders in EVE can’t sit safely on the sidelines giving orders; they’ve got to sit right in the middle of battle like everyone else. As you might imagine, this makes them primary targets. But a new ship coming with this month’s update might change all that. Often, a Fleet Commander, usually abbreviated down to FC, serves as the anchor point of a fleet. Other players instruct their ships to follow in close formation to the FC to ensure optimal positioning and tactical maneuvering. Because of this, EVE has developed a culture of assassination. Enemy fleets will often try to find the FCs (especially the more famous ones), prioritizing killing enemy leaders because when an FC goes down, it can spell doom for the fleet they were leading. There are a few things that players try to combat this tactic. Fleet commanders will often sacrifice the offensive capabilities of their own vessels, opting instead to further harden their ships against damage and electronic warfare. Some have multiple alt characters that they will use in backup positions in the fleet, so that once their main pilot has been killed, they can assume command under the new character. Another common tactic is to bring multiple backup players who are capable of assuming command should anything happen to the primary leader. These tactics all have countermeasures of course, and even a few moments of hesitation during the transfer of command after an FC has been disabled can end up causing that FC’s fleet to be forced to disengage an object, or even worse, be completely destroyed. CCP, EVE Online’s publisher, has been watching this situation for years, and taking feedback from the player base on what, if anything, can be done to curb this tactic—if indeed it should be curbed. Some players see the “headshot” of an enemy FC as the ultimate in dishonorable combat tactics, and refuse to ever engage in it. Others, however, have adjusted their entire organization’s standings structure so that enemy FCs appear as the most desirable and easily identifiable targets. Players that accept the tactic view it as an extension of the game’s sandbox feel, one that rewards superior intelligence networks, strategic planning, and effectiveness over concepts like honor and fairness. This has caused trouble for any design change that has been proposed to circumvent the strategy in the past, because there needs to be a solution that everyone can accept and that does not inherently infringe on the sandbox aspect of EVE Online. 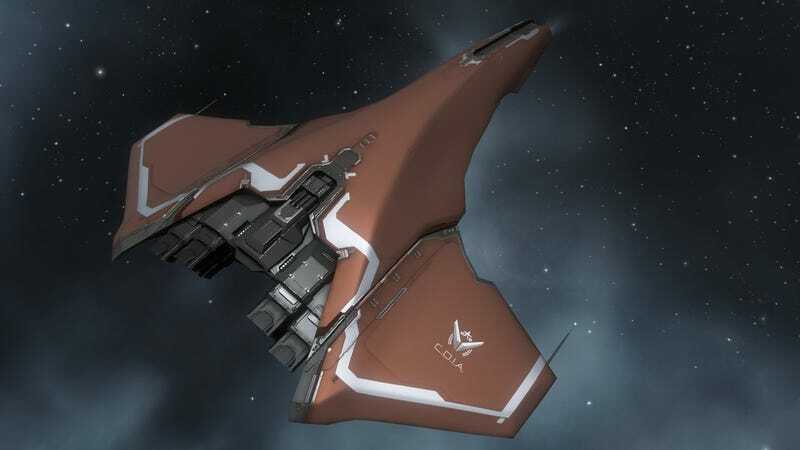 That solution is coming in the March update to EVE Online. It is called The Monitor, the first hull in a brand new class of ship called Flag Cruisers. The Monitor has been designed specifically forthe role of leading a large player-based fleet. It boasts a stronger sensor suite than any ship of the same size, preventing it from being affected by the majority of the game’s debilitating electronic warfare. The shields and armor on the cruiser-sized vessel are capable of withstanding more punishment than any similarly-sized ship. Two large fleets fighting each other. But the Monitor does come with a few downsides to make up for these enhanced defensive capabilities. It is almost completely incapable of taking any offensive action, has no weapons, and has no electronic warfare options either. The only remotely offensive action the ship can take is aiming a very weak laser pointer, to designate enemy targets and ensure that the fleet commander can get credit for kills. These drawbacks are intentionally designed to limit the new ship’s usefulness, so that it does not become the only viable platform from which to lead fleets. Player reactions to the new vessel have been mixed—although largely based on theory, as the ship has not been tested in combat yet. Some players do not believe that the ship fits the needs of the FC role due to the severe limitations placed on it. Others see the ship as a threat to the integrity of the sandbox feel of EVE, where all decisions are supposed to be made by player agency rather than by design limitations imposed on the players from an outside force. They view the new ship as a way of simplifying and condensing a skill-intensive part of the game, and as something that violates the spirit of EVE. “The biggest benefit is large battles where you can be vollied by massed arty,” Asher Elias, one of the senior fleet commanders of The Imperium, one of the game’s largest player- run coalitions. By “vollied by massed arty,” he is referring to a current trend in EVE fleet battles, which is to use slow-firing guns with large burst damage, all firing at the same time.This causes a massive burst of damage on enemy ships that in theory allows for no time for support ships to prevent or repair the damage. CCP’s design team has been very plugged in to the player reception of the Monitor already. Due to the feedback from the vessel’s introductory post on the EVE forums, major revisions to the ship’s design have already been promised. The initial design of the ship did not include the target-painting laser pointer feature, which was a point of contention for many players, including Asher. “I don’t care about my killboard but I don’t really have a good memory,” Asher said. “Killmails are like mementos of battles past, you can look through them like a picture album and jog your memory.” For a player to get credit for being part of killing another ship, that player must take some form of offensive action against their enemy. Without any of these actions, no record of your ship being involved in the death of another is created in the game’s logs. The laser pointer solves that problem. Also in response to player feedback, the Monitor was also granted the ability to carry a set of scanner probes, used by fleet commanders to find isolated enemy ships and maneuver their fleets to engage and destroy. Will the Monitor forever solve the “headshotting” subculture that exists in EVE’s biggest player battles? Probably not. However, it will give players new tools to keep their FCs safer on the battlefield.